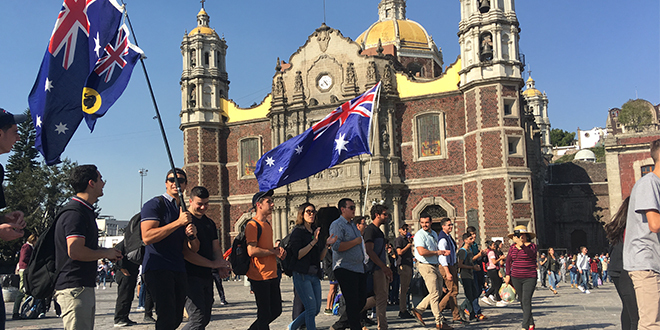 Faith journey: Young Australian pilgrims celebrate while visiting the old Basilica of Our Lady of Guadalupe in Mexico en route to Panama WYD. 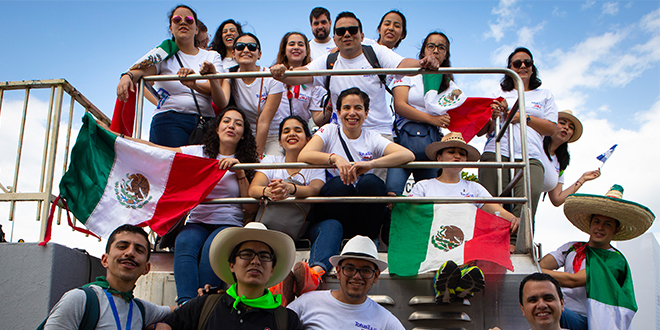 AUSTRALIAN flags worn as capes, temporarily tattooed on arms and cheeks, and others held high above the crowds marked the entrance of the green-and-gold pilgrims into Panama City for World Youth Day 2019. An estimated 1000 Australian Catholics journeyed in faith to Panama for the five day event held from January 22 to 27. They joined hundreds of thousands of Catholics from around the world, led by Pope Francis, and the cardinals, bishops and religious men and women of the Church. For 16-year-old Panamanian-Australian Catholic Charlie Martin, WYD presented the opportunity to come in contact with a physical reality of a Catholic Church that was alive in the Americas centuries before his native country became an independent nation in 1901. He said it was a chance to come in contact with a story told by the many historic buildings where Catholics in the region worshipped and where they had built lives of faith. But he said he also experienced different expressions of that faith than he was used to. “It’s been an amazing (greeting), you feel like a celebrity,” he said, explaining the warm welcomes expressed by Panamanians when they see the pilgrims walking about. Locals wave at buses carrying pilgrims and local businesses have placed posters on storefronts welcoming them and Pope Francis to Panama. “Que viva la virgin,” some of the Mexican pilgrims began shouting, cheering on the Virgin Mary. “Que viva el papa,” they shouted, cheering on the Pope. Their joy drew smiles from seminarian Hien Vu from Xuan Loc, Vietnam. “I want to experience this enthusiasm,” he said. One Mexican pilgrim, Jorge Soto, wore a wrestling mask of Lucha Libre fighters from Mexico, a proud symbol of his native country. He said he was proud to represent his people at WYD and it was a time when “you feel good about everything”. “It’s up to us to come up with solutions and help others not slip away from their lives of faith,” he said. Part of what WYD provided, he said, was a kinship and strength in spiritual beliefs, even if people came from different parts of the world. For many pilgrims, Panama wasn’t their rst stop on pilgrimage. Some pilgrims went to holy sites in Mexico and the United States. One group of Sydney pilgrims stopped in Washington DC for the March for Life, an event that drew hundreds of thousands of pro-life marchers. Raised above the heads of 18,000 Catholics at the Mass for Life in the Archdiocese of Washington was the familiar sight of the in inflatable green-and-gold boxing kangaroo. Beneath was a young Sydney woman with an Australian flag on her cheek. Monica Pazniewski, a 23-year-old student, was with a group of about 120 young adults from Sydney archdiocese who stopped in Washington to join the March for Life before continuing on to World Youth Day 2019 in Panama. Ms Pazniewski said she had come to the Youth Rally and Mass for Life preceding the march “because I believe every human life has dignity and value, and I want to stand up for everyone”. Sydney Archbishop Anthony Fisher led the 120 Sydney Catholics. “For us to see so many people standing up for life is inspiring,” Archbishop Fisher said.